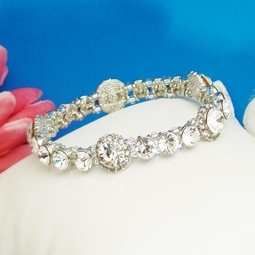 Crystal Encircled Bangle CZ Bracelet -- SALE!! HOME / BRIDAL JEWELRY / Wedding Bracelets / Crystal Encircled Bangle CZ Bracelet -- SALE!! Description: Beautiful Cubic Zirconia bangle bracelet 8243 has a stretchable wrist with gorgeous circular crystals that wrap around entirely. 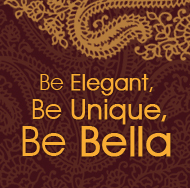 This is perfect for a wedding, special occasion, prom, or even a night on the town. 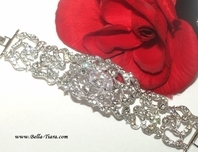 This is an item that can be worn repeatedly and always look stunning.